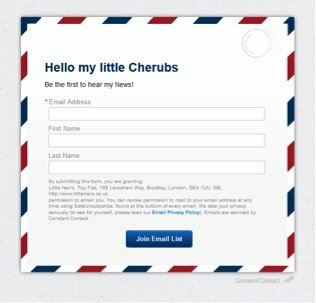 Weâ€™re all familiar with the idea of email marketing: encouraging prospects and customers to join a mailing list so that we can send regular updates and create a relationship with them. However, you probably donâ€™t know quite how well it works, and how good email is at generating sales. Recent statistics from the Direct Marketing Association show that email has the highest bang-for-buck of any digital marketing technique, delivering an average of Â£38 in sales for every Â£1 spent. So the question is: how can you use the power of email to turbo-charge your overall digital marketing strategy and online presence? 1. Highlighting new pages or items on your website. Drive targeted traffic to your website by sending a specific call to action to your mailing list. 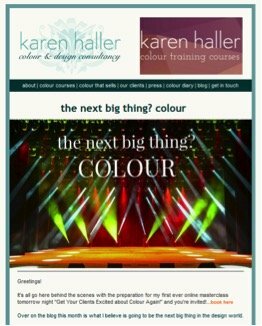 Applied colour psychology expert, Karen Haller, has done that here to share information about her upcoming webinar and encourage registrations. This means sheâ€™s not reliant on her webinar being discovered randomly, for example via social media, or on her audience happening to return to her website at the right time instead, sheâ€™s able to get her opted-in subscribers straight to her registration page to get them signed up. 2. Target a section of your audience with specific information. How you manage your email marketing list is as important as the information you send to them. You can sort your subscribers into different groups depending on their interests, needs and behaviour and then send each group the best information or call to action for them. In this example, networking guru, Andy Lopata, shares a video tip as part of his monthly newsletter. 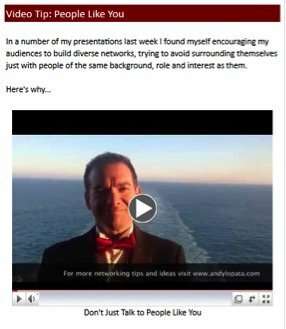 Andy is a professional speaker and most of his newsletter subscribers have met him at an event that he spoke at, so video is a great way to build on that positive experience and create a deeper relationship with those people. 3. Get your surveys completed. Surveying your audiences is a great idea. Whether itâ€™s feedback on your website, blog, customer process, or products & services, subscribers just love to comment! This insight will give you useful information to take your digital marketing further. Email an invitation to complete your survey to your mailing list. Youâ€™ll get feedback very quickly and will also be able to tell which of your subscribers are the most positively engaged with your brand. Bonus tip: Respond individually to those that complete your survey. They wonâ€™t expect it, and it will highlight your respect for your audience members. 4. Get your best content into their inboxes. I want you to try this: look at your most engaged-with content on your blog and social channels over the last month and put the top three items into your next email. This works in two great ways: 1) Most people donâ€™t have time to scour blogs or social channels for great info, however they WILL read relevant information thatâ€™s delivered directly to their inboxes. 2) You donâ€™t have to worry about whether what youâ€™re emailing out will resonate with your audience because youâ€™ve already tested it on your social media and blog followers. Hereâ€™s a cool example from Gecko Clothing who are about to launch a new kids clothing line. 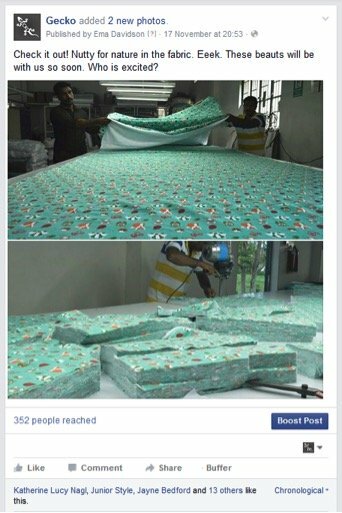 They got nice engagement and a good handful of likes for this post on their Facebook page, so they know that these pictures would be good to include in their next newsletter too. 5. Get social media followers onto your email database. 6. Target your subscribers where theyâ€™re hanging out. Do you know about custom audiences for Facebook? Within Facebookâ€™s set of advertising tools, you can upload your email mailing list and have them target your Facebook ads to those people who are already on your mailing list. This will reinforce your message and allow you a second contact point with those people who you know are already interested in what you do. 7. Carry on the conversation with Pay Per Click prospects. You invest good money in your Pay Per Click strategy, so make the most of your investment by getting your site visitors to join your email mailing list. They are interested enough to click on your ad, so if you offer them something enticing, they are very likely to join your mailing list as well. This means that you will have forever-and-a-day to sell to them, rather than relying on them buying as soon as they hit your PPC landing page. If you want to get fancy, you could even track the Google Shopping ads that customers are clicking on and then email them more information about those specific items! 8. Make your search engine optimisation (SEO) work harder! SEO is another thing that businesses put a lot of time and effort into so you want to get the most out of it! If you have a particular webpage that you want prospects to land on, itâ€™s easy to push them there with email marketing. 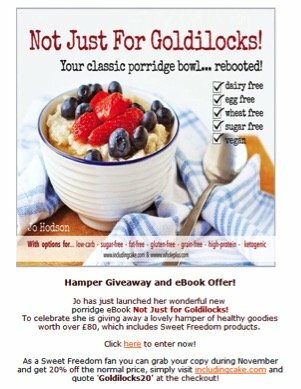 This is exactly what healthy food brand Sweet Freedom did with their latest newsletter â€“ they sent their subscribers to this recipe book offer that features their products as key ingredients. You can use one, or all, of these ideas to get your various marketing strategies working harder for you. Everything that Iâ€™ve shared here can be done within Constant Contact too! Itâ€™s not difficult and the impact can be huge, so hop to it and get emailing now! Creare are offering all their readers a free 60 day trial with the Constant Contact platform, click here to start yours today. Tamsin is the UK small business marketing expert with our partners Constant Contact. They offer a low-cost, easy-to-use, email marketing tool backed up by real people on the phone to help you when you need it. Tamsin has a wealth of experience having been a small business owner herself and taught over 5,000 UK small businesses how to execute their marketing more effectively. She lives on a boat in Kent and loves dogs, shoes & cakes. Connect with Tamsin on Twitter, Facebook or LinkedIn.